The 2019 1 oz Year of the Pig Gold coin is the exquisite finale to the Perth Mint's outstanding Lunar II series. Featuring a delightful reverse design and with a fineness of .9999, it's a must for serious collectors as well as a smart investment. This eagerly awaited gold coin will sell out fast so be sure to place your order with coininvest.com today. The Perth Mint's Lunar I series of bullion coins was so successful that Lunar II was launched on its completion. Now surpassing the popularity of their predecessors, the Lunar II gold and silver coin collections are loved by numismatists across the globe. These highly-popular coins are renowned for their purity and for their beautiful reverse designs. The Lunar II series began in 2008 with the Year of the Rat and concludes with the truly impressive 2019 Year of the Pig gold coin. The coin is available in a range of sizes, including the ever-popular 1 oz version. The 2019 1 oz Lunar II Year of the Pig gold coin is a fine example of the mint's dedication to quality and craftsmanship. It's the 12th coin in the Gold Lunar II collection honouring the animals of the Chinese zodiac. While the mint's Silver Lunar II coins feature a female pig with her young, 2019 Year of the Pig Lunar II gold coins show a male pig or boar under a blossoming branch. Snout proudly raised, he epitomises loyalty, dependability and generosity, traits said to be shared by those born during the Year of the Pig. The Chinese pinyin characters for 'pig', the mint's 'P' mintmark and the inscription 'Year of the Pig' complete the reverse design. As always, the coin's obverse carries the Sir Ian Rank-Broadley portrait of HM Queen Elizabeth II. Why choose the 2019 1 oz Lunar II Year of the Pig gold coin? The 2019 I oz Year of the Pig gold coin is the pinnacle of your Lunar II collection or an intriguing addition to a mixed collection. It’s also an excellent investment; each coin is struck from .9999 pure gold and a very low mintage only adds to its overall value. 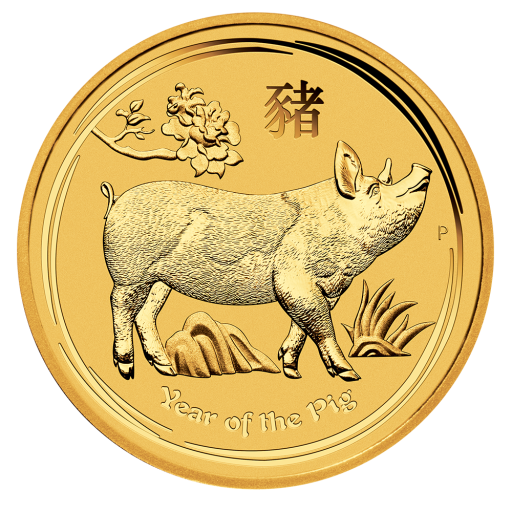 2019 1 oz Lunar II Year of the Pig gold coins are shipped individually in capsules, 20 in foil or as boxes of 100. These impressive coins are sure to be in demand so be sure to order quickly with CoinInvest to avoid missing out.